By Kimberly Furry on March 14, 2011 Visit Kimberly's Website. I purchased a few books and searched for some books at our local library about building chicken coops. Unfortunately, they weren’t what I imagined. I’ve searched the Internet endlessly and the Community Cluckers blog. I have some ideas and great pictures, but nothing concrete with regards to actual plans. I’m no carpenter, but thankfully Derek has a lot of aptitude when it comes to building and constructing. Neither of us can put something together without some basic instructions. I was inspired by one blog where a guy made a really cool looking coop from Ikea items, but there’s no Ikea even remotely close to us and the supplies he used were really pricey. I have a twin size futon frame that has taken up residence in the basement after my college days. Maybe there’s some potential with that piece to be re-purposed. We have quite a bit of leftover chicken wire from garden fence projects. More than anything we want to construct a coop on the cheap with whatever we have lying around. I’ve ordered another book from the “Dummies” series called Building Chicken Coops for Dummies and Chicken Coops: 45 Building Plans for Housing Your Flock to see if it can get us on track with a design plan or a least give us a better idea of what we’d like for a coop. I think a chicken tractor would be great. I like the idea that we could move the chickens around our yard, taking advantage of the shade from the pine trees in the summertime or have them closer to the house during those cold, northeastern winter months. Did I mention that we’ve had a lot of snow? “A lot” is an understatement this year! I also really dig Community Clucker Rebecca Nickols’ living roof on her coop. I make living wreaths, so I have a wealth of sedums in and around and just about everywhere in the garden and lots of good friends always willing to share their sedum bounty. I am definitely working a living roof into the plans! 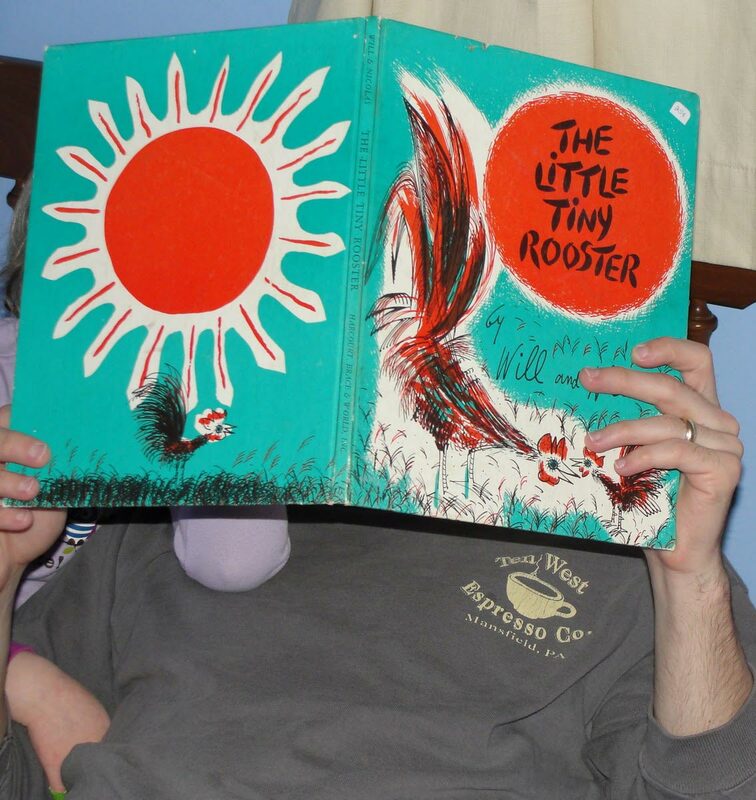 On the upside, bedtime stories with the girls have been all about roosters and chickens. Ara’s favorite read was a great find at our local library’s book sale. It’s called The Little Tiny Rooster by William Lipkind and Nicolas Mordvinoff. It’s from the ’60s and out of print, but there are many used copies available online and hopefully some copies still in libraries. Another good book we’ve read is Big Chickens Fly the Coop by Leslie Helakoski and illustrated by Henry Cole. This one is in print and pretty easy to find. We picked up our copy at the last Scholastic book sale for $2.50 at Ara’s elementary school. The girls love all things chickens and these books are filling them with excitement and inspiration! Betsy, you are absolutely right! It gives me some great ideas and pictures, which I wasn’t after. The “plan” we like says we have to go to the designers’ website to purchase the plans . . . ugh! What a bummer! I will be mentioning all of this in my next blog to save others frustration and disappointment. I am glad to hear they might rework the book and revise it. Pam, the Dummies book has turned out to be the best book by far. We are ironing out plans this weekend and hopefully starting construction shortly thereafter. I’ll be blogging as we build! I’ll be looking forward to your post on the nesting boxes! We got the Chicken Coops for Dummies book and have liked it. It reviews basic carpentry skills, which we really need. My husband just used it to build some new nest boxes that I’m going to feature at pamsbackyardchickens.blogspot.com sometime in the future. What I liked best was that there are plans to accommodate small and large flocks. I hope it helps you too! If it isn’t too late, cancel the 45 building plans book…it’s a waste of money. I bought it and it didn’t help at all. Later I checked amazon site and their review of the book and that’s what others said, waste. The author is supposedly re-doing it because of so many complaints. The title is NOT accurate…there are NO PLANS. There’s no plans that are of any use, just basic drawings. No measurements or anything. There just aren’t any good books out there with actual plans (measurements, tools list, supplies list) of any use.